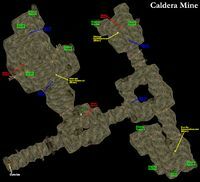 Caldera Mine is an ebony mine just over the mountains west of Caldera. All major powers in Morrowind have an interest here. 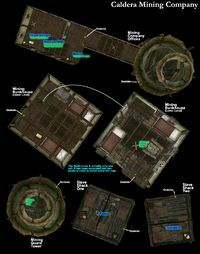 The mine is run by Imperial Charter by some of the most corrupt elements within House Hlaalu, and staffed by slaves. As you investigate, you will find that Cunius Pelelius is using this mine to fund a personal project. House Redoran is known not to be pleased with this state of affairs, since it considers Caldera to be Redoran territory. Some thieves hired by House Telvanni in a cave nearby also cause some trouble. Even the Emperor's spies keep an eye on the going-ons. The mine is moderately sized, and is protected by 3 House Hlaalu guards. 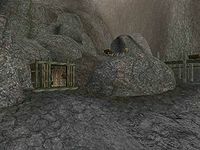 The mine is worked by 3 named Dunmer miners and 4 named slaves. Freeing the slaves causes the production of the mine to slow down. One slave specifically might stir up trouble. The bunkhouse contains some crates with raw ebony. The ledger here shows nothing out of the ordinary. Two differing Caldera Record Books exist known as Caldera Ledger and Secret Caldera Ledger. A further related document is the Caldera Mining Contract. 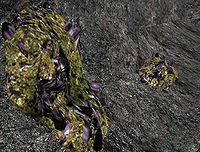 A key to the Slave Bracers can be found in the Caldera Mining Company Bunkhouse, in the Caldera Mining Company Guard Tower, and on Stlennius Vibato in the Caldera Mining Company Office. Freeing any slaves in the mine will count toward the 20 slaves you need to receive the code phrase and unlock The Twin Lamps quest from Ilmeni Dren. However, if you plan to do the Redoran quests here, do not free any of the slaves until after you have finished both or you will be unable to complete them. The Guard Tower holds some random Imperial armor and ingredients. Several notes detail the state of unrest among the slaves.